I believe that Thanksgiving is doomed. Those twenty-somethings alive today will probably be the last generation to experience anything close to the traditional holiday. 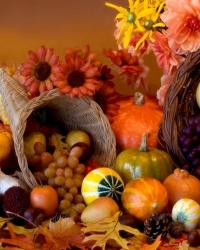 A quarter of a century from now, Thanksgiving will still be on the calendar, but like Halloween few will celebrate it. When I was a kid, a half century ago, Halloween was a big thing. Hoards of children would roam subdivisions for their treats. When I was a teen, I grew out of the treating and went in for tricking, dressing up in some fashion to hand out candy to the little ones, and perhaps scare them, while herds of goblins still moved through the neighborhood. Several decades later, as an adult, Halloween become more about adult parties. I met my second wife at one costumed affair. My child was trick-or-treating then, but the groups of children that moved through town were smaller and sparse. Perhaps decades of stories of needled apples, which never really happened, had scared parents into keeping their children in. But I don’t think that is what has led to Halloween’s demise. For decades now I have been lamenting the underwhelming quality of Thanksgiving. When I was young, it was a big thing for my family. It seemed to be an important holiday all across the nation. But for some time now the Halloween displays in stores have given way to Christmas displays. Shops do not lay a spread for Thanksgiving. The running comedic Thanksgiving joke is about the drunk uncle and the immensely uncomfortable Thanksgiving gathering followed by the sleepy time football game. But I think that is not what will lead to Thanksgiving’s demise. Halloween did not die because of the poisoned apple. It died because too few benefitted from it. Candy companies and costume shops and of course the little children were the only ones to profit. Likewise, Thanksgiving benefits too few. Turkey farmers, cranberry growers, and grocers gain the most. There could be whole cottage industries peddling Thanksgiving-based nick-knacks, but it would still be too small a group, and it would steal from the real feast. The doom of Thanksgiving is the jolly man in the bright red suit. Well, no, not Santa Claus, but what he represents. Thanksgiving’s fate is sealed by the almighty dollar, to which Christmas is the greatest gift. It is all about the Benjamins. No matter what those folk on Faux News might say there is no war on Christmas. Christmas will continue for as long as commercialism lives. People will be able to celebrate it in any way they want, and big business will make sure it is celebrated. It will survive and grow until it consumes all holidays. The Halloween decorations come down and Christmas goes up. Thanksgiving is hardly a notion. New Years is not so much the heralding of something new as an extension of the holiday shopping spree. Everyone benefits from Christmas. Candy bakers and costume makers, football watchers and nick-knack collectors, turkey farmers and grocery store owners, television sets and cars, and anything you can think of can work its way into Christmas. Conditions not afforded Halloween or Thanksgiving. Thanksgiving has given way to Black Friday. The day after Thanksgiving is now more important to most, in much the same way that stores throw up Christmas regalia the day after Halloween. Now we learn that many major retailers will call their workers in on Thanksgiving, all but eliminating their holiday. Why? To beat down Black Friday, to be the early bird and nab the almighty green worm. In a few years doing business on Thanksgiving will be normal. Not many years after that few will bother celebrating it, Thanksgiving will be too much trouble to arrange around work. Christmas with its tie to mass commercialism has won. Thanksgiving is doomed. This entry was posted in Philosophic, Video and tagged Christmas, Thanksgiving. Bookmark the permalink.